[ACEL]: Hi Nicole! 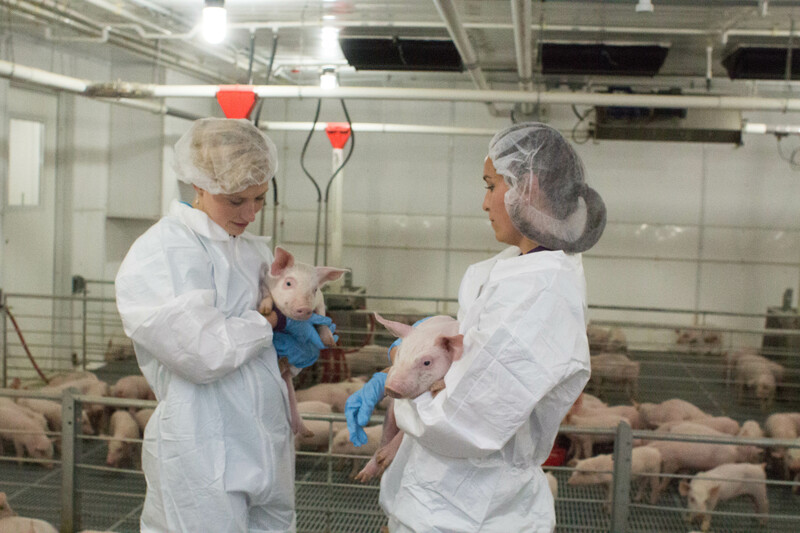 Why did you choose to major in Agriscience Education? Growing up, I knew I always wanted to be a teacher. Helping teachers organize their classroom, grade papers, and even help to teach throughout elementary, middle, and high school was always a highlight of my school day. I would even play school with my friends and cousins on weekends and holidays where I was always the teacher and had binders full of worksheets to teach with. In middle school, I discovered how much I loved solving equations and was therefore set on going to BGSU and becoming a math teacher. But my life and career path changed when I stepped foot into my high school ag room. 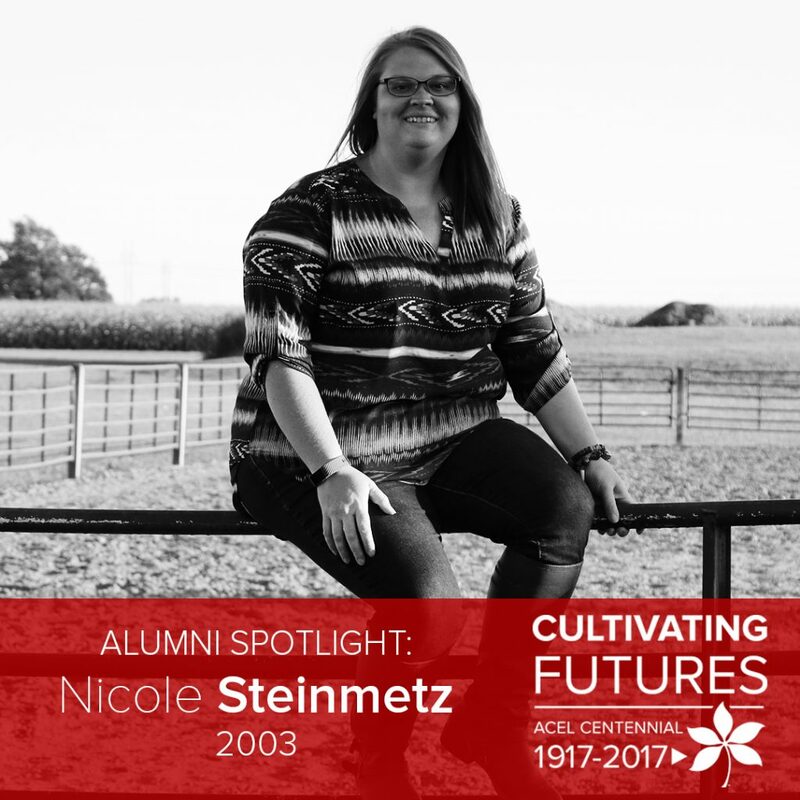 I had always been a member of 4-H, but my passion for agriculture was set on fire and I just couldn’t get enough of learning new things, trying new CDEs, and attending FFA activities. My agricultural educator was a prime example of an educator, mentor, and motivator. He pushed me to memorize the FFA Creed, learn parliamentary procedure, become an officer, and do so much more in the FFA that made me the person I am today. Year after year at State and National Conventions, he would always make me go to the Ohio State Booths and introduce me to everyone there, telling them I would go to OSU even though I kept saying I was going to BGSU. Unfortunately, my senior year brought some unexpected changes when I got the call from the superintendent that my ag teacher was in a fatal accident a couple hours ago. As chapter president, I took charge and my career path changed. I discovered my passion and dedication to agriculture was stronger than I ever realized and that ag teachers aren’t just teachers, but a huge impact in the students’ lives. Mr. Robert Hoffman was right, I wanted to do what he had always done for us: challenge us to change into the best version of us that we could be. I wanted to share my passion of agriculture, but also help to shape young adults into leaders and achievers. 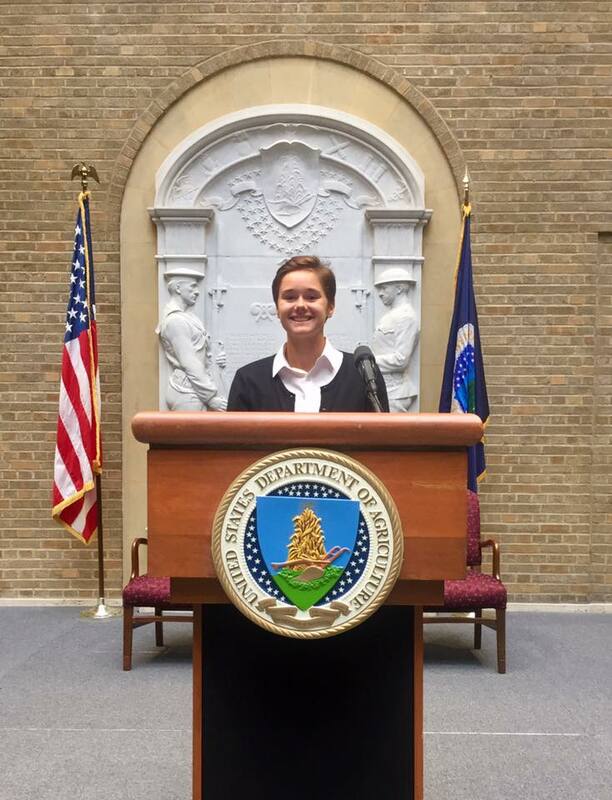 I wanted to give back to what had transformed me: Agricultural Education and the FFA. Once I knew that Agricultural Education was the major for me, there was no other choice in my mind. The Ohio State University was the only place for me. My older brothers were both students at The Ohio State University and I saw first-hand the experiences they had, the people and connections they made, and the quality of education they both received. I always knew that teaching was what I wanted to do and my education at Ohio State reinforced my desire. 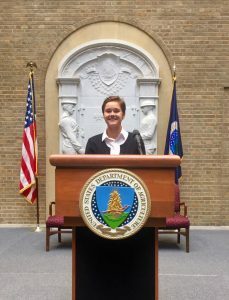 Through my involvement in student organizations, wide range of agricultural classes, and the faculty and staff at Ohio State, I was able to prepare myself for the classroom. After my Early Field Experience, BLOCK, and Student Teaching, I was excited to teach! As an Ohio State student, I took full advantage of getting involved. Through connections that my brothers had made at OSU, I was able to begin my involvement already at orientation when I was trained for the student assistant for CFAES Human Resources & Fiscal Departments in the Dean’s Office and continued in that position until graduation from OSU. Just about any night of the week, you could find me at a student organization meeting. I began my involvement with the Agricultural Education Society, Collegiate 4-H, and being on OSU Holiday High School Visitor. By spring of my Freshman year, I was a CFAES Ambassador, on the Scarlet & Gray Ag Day Planning Committee, CFAES Banquet Steering Committee, and Committee of 88. Throughout all these organizations I led in various ways such as president, vice president, co-chairs, treasurer, and committee chairs. I was honored to be elected as the OSU Undergraduate Student Government Senator for CFAES at the end of my Sophomore year and became a part of The Ohio State University Senate under the lead of President Gee. In addition, I served on the CFAES Student Council, CFAES Advancement Team, Student Panel for CFAES Assistant Dean of Academic Affairs Search and ACEL Department Chair Search, CFAES Top 20 Seniors Selection Panel, and more in the College of Food, Agricultural, & Environmental Science. I began professional development at OSU by attending Cultural Competency Seminars, Ohio Soybean Industry Tour, Ohio Agri-Business Tour, Scinece Inquiry Based Teaching Institute, and Professional Development Nights. I was also inducted into the Towers Agricultural Honorary and the Gamma Sigma Delta International Agricultural Honorary. I was recognized as a CFAES Top 20 Senior and an OSU Top 20 Outstanding Senior because of my overall involvement at The Ohio State University. What classes did you enjoy the most while at Ohio State? What was your favorite and why? I truly enjoyed the majority of my classes while at Ohio State, but my favorites were: BLOCK classes and trips to FFA Camp and Pennsylvania, food science and processing, welding, construction, public speaking, teaching methods, animal sciences, chocolate science, cultural competencies, and history of OSU. What professor, faculty or staff member had an impact on your education/career? How? All the people at Ohio State had an influence, but Dr. M. Susie Whittington had the biggest impact on my education and career. She immediately made me feel welcomed to the ACEL family and took a special interest in me, my family, and my passion and desires. Not only did she influence me in the classroom, but also as the advisor of Agricultural Education Society. Her strong passion and excitement was always shining and contagious. She was also the reason why I got involved with undergraduate research focusing on cultural proficiency and did several presentations including the North American Colleges and Teachers of Agriculture Conference, CFAES Research Forum, OSU Denman Undergraduate Research Forum, Annual National Urban Education Institute, and published by Annual National Agricultural Education Research Conference. As a result, I was also able to graduate with Research Distinction on my diploma. Dr. Whittington was and still always there for advice and guidance. It’s the little things that make her such an impact on my career whether it’s a hug and asking about life or sending a text to say happy birthday. 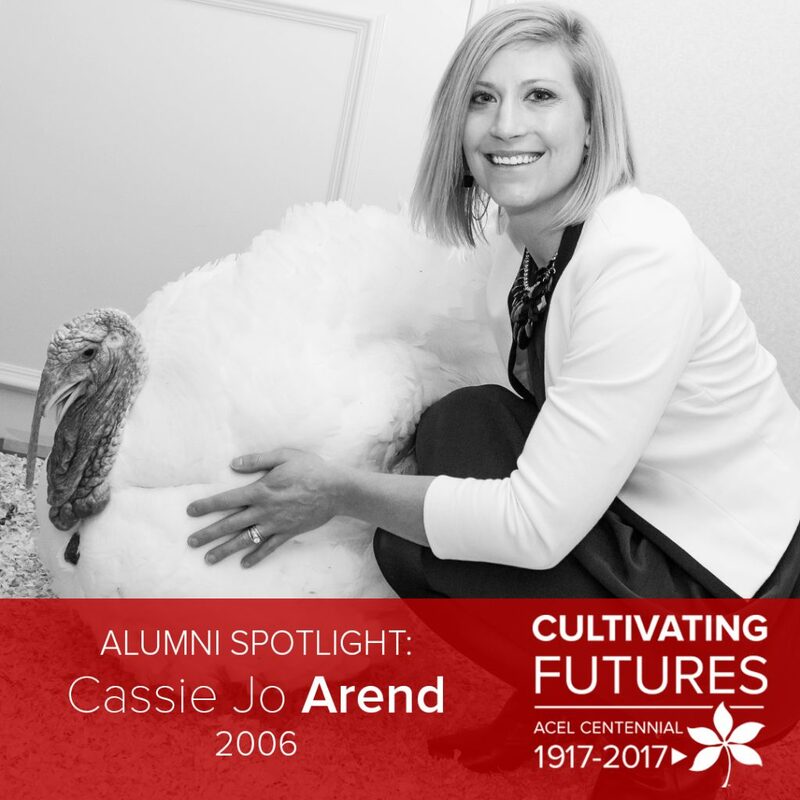 She has been a great role model as a leader in agricultural education and The Ohio State University. So many memories flow through my mind as a student at The Ohio State University- leading student organizations, organizing Scarlet & Gray Ag Day, going to mirror lake jump with the ACEL Department Chair, the discipline lab for Methods class, welding class, helping others choose OSU as a college ambassador, going to President Gee’s house for an Undergraduate Student Government social- but my favorite memory overall would have to be when I found out I was selected as a Top 20 Outstanding Senior for The Ohio State University. This came as a complete surprise to me as I had always worked for a cause, not applause. I was doing what I loved and having a blast doing so; it wasn’t about winning an award. I was blessed with this honor to be recognized for all the hard work and dedication I had given to my classes, research, and student organizations as well as my love for The Ohio State University. What was your first job following your education at Ohio State? Following my education at Ohio State, I began my teaching career at Riverdale Local Schools in Mt. Blanchard, OH. Following graduation from OSU, I was blessed to serve on the CFAES Alumni Society Board for three years. I have continued my career with Riverdale Local Schools where I have taught courses including: Introduction to Agriculture; Agriculture, Food, & Natural Resources; Livestock Science; Plant & Animal Science; Ag Business Management; Mechanical Principles; Science & Technology of Food; Ag Communications & Leadership; and FFA Officer Capstone. In 2014, I implemented a middle school program. I have also served as the District Membership Chair since 2014. Furthermore, I have served as the Riverdale Education Association Treasurer and currently as Co-President. In 2016, I began work as the Hancock County Junior Fair Coordinator and Junior Fair Board Advisor in addition to teaching at Riverdale. I’ve been blessed to be nominated by students and teachers to be recognized as the Teacher of the Week several times at Riverdale. Last spring, I was also nominated by a few students for the Hancock County Golden Apple Award. This award is designed to recognize the best of the best teachers in Hancock County. I have been selected as one of three finalists in the high school division and the winner will be announced on October 18. I’ve worked with great students, earning 15 American Degrees and 25 State Degrees. 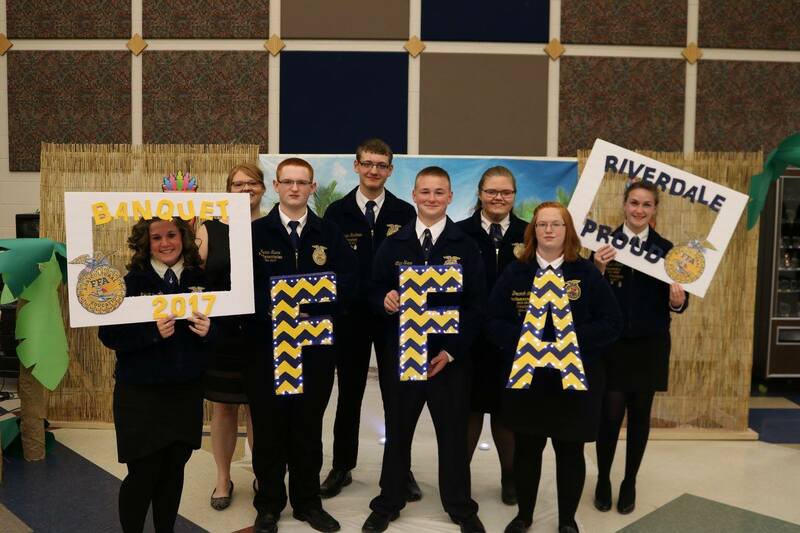 We’ve been a recipient of several grants including: Food for Thought, Monsanto Growing Rural Education, National FFA Living to Serve, Syngenta Blue Jacket & Chapter, and others. 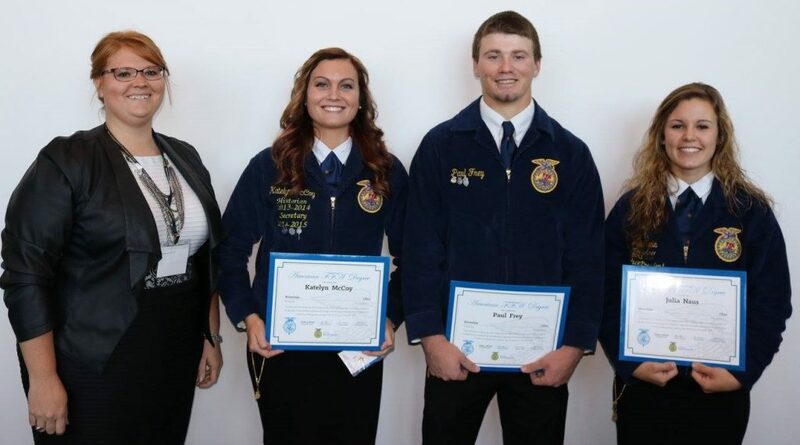 I’ve seen students grow and realize they are a part of something bigger than themselves while at State Convention, FFA Camp, Washington Leadership Conference, or National Convention. We’ve had several state CDE teams including Parliamentary Procedure, Ag Power Diagnostics, and Food Science. I’ve been able to work with two OSU students for their Early Field Experience. I’ve experienced Washington Leadership Conference with agricultural educators from all over the nation. I’ve attended great professional development workshops. But most importantly, is the reward of seeing growth in my students. Knowing that “my kids” are stepping out of their comfort zone to change themselves, their school, and their communities is such an incentive to keep doing what I’m doing. I love helping students realize their passion for agriculture and choosing a career in agriculture. 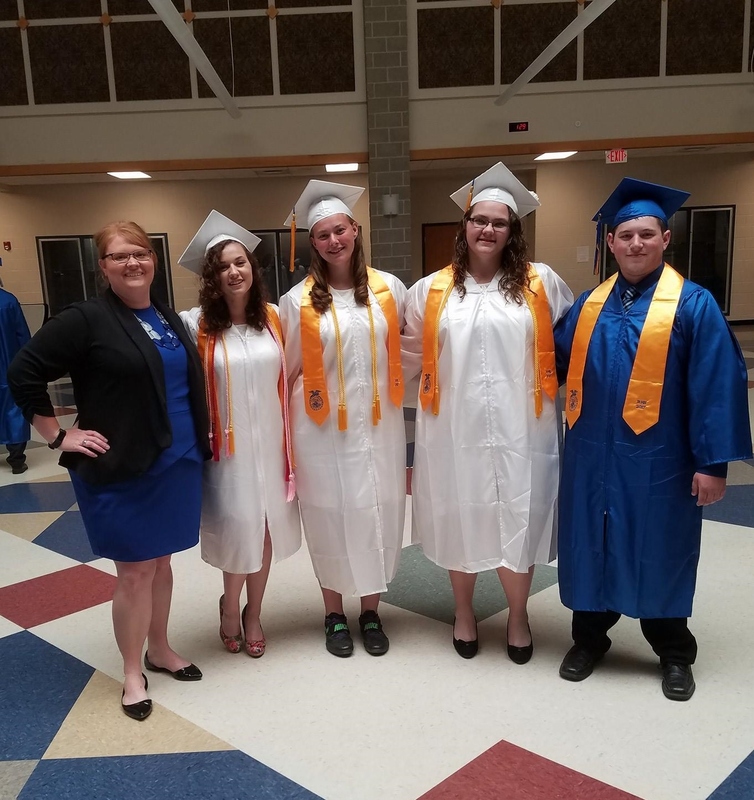 The biggest highlight was seeing “my first babies” grow from freshmen to seniors, graduate, and now some of them in agricultural careers or pursing degrees in agriculture, even agricultural education! My best advice to current students is to “Live the Dash” – truly live that little line between your year of birth to year of death and to live each day to the fullest. Keep learning, make mistakes, get involved, challenge yourself, try new things, never regret, and don’t take any day for granted. The experiences you have at OSU and the people you meet at OSU will change your life. ACEL cultivated passion in me – my passion for agriculture, relationships with people, and my passion for learning. ACEL grew the fire inside of me for teaching and making a difference in the lives of other each and every single day whether it’s big or small. Allen Auck completed a bachelor of science in agricultural education in 1983 and a master of sicence in 1999. Auck currently works for Ohio 4-H Youth Development as a program manager for events and activities. [ACEL]: Hi Allen! Why did you select a major in agricultural education? [Auck]: I chose agricultural education because I had an interest in teaching. Ohio State was one of only two colleges that offered the agricultural education major. I was involved in Collegiate 4-H, Agricultural Education Society and I worked basketball inter-murals as an official. My first job following my education at Ohio State was a vocational agriculture instructor. Throughout your career, where have you worked? Bluffton Exempt Village Schools, Erie County 4-H Camps and The Ohio State University. Meritorious Service Award, 4-H, 25 year award. Aaron Fowler is a student in our online Master’s program and is also a Program Assistant for OSU Extension Greene County. A native of Greene County, Aaron grew up in Fairborn, Ohio where he was first introduced to 4-H when he was 16. Aaron joined 4-H in high school and credits the program for helping to “break him out of his shell.” Although Aaron participated in other activities such as ROTC and Marching Band, he feels that the 4-H is unique in its ability to provide each person with an individual voice and find that person’s unique talents. Aaron found that 4-H helped him to see leadership as something that can be grown and nurtured instead of a characteristic that some people are born with. 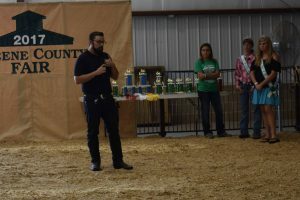 He says that 4-H gave him a sense of purpose and impact as well as an ability to see that what he had to offer was valuable and not just a repeat of what someone else had to offer. 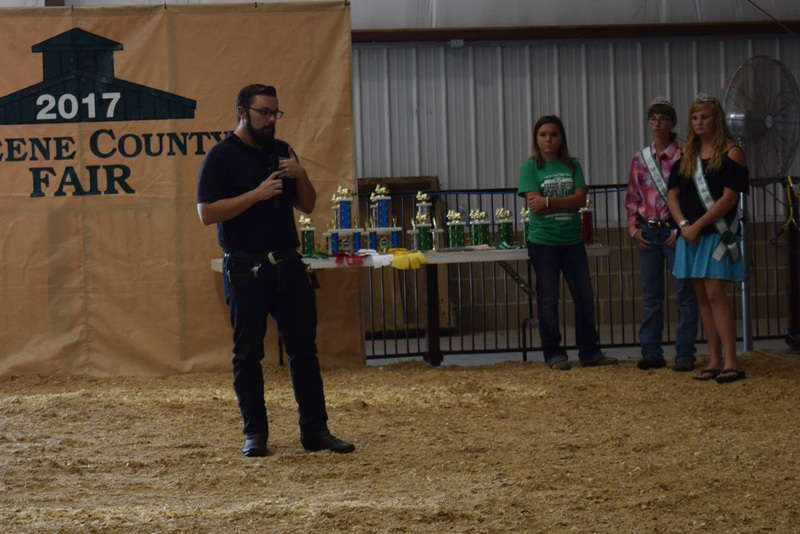 His positive experiences with 4-H have helped shaped his career decisions and are helping to direct Master’s project as well. Aaron earned his undergraduate degree from Wright State University where he majored in Psychology. After college, he went to work for a local mental health organization where he worked with clients in group home settings. While he enjoyed this experience, he found that he was limited in the ways in that he could help clients and so the impact was not always as good as it could have been. One way Aaron saw that he made a difference was when clients came to Aaron to talk through their troubles. He could see that these mini- therapy sessions were beneficial and that many times his clients just needed someone to talk to. 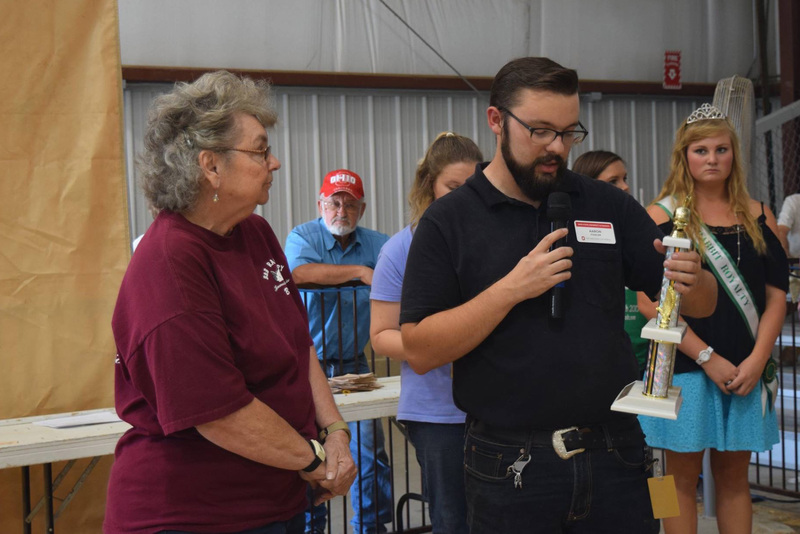 While this was rewarding, he was sometimes frustrated with a system that he wished was “a little bit different.” Aaron was still involved in 4-H as an advisor and found that he enjoyed this type of a role which led him to consider a career in Extension. Aaron’s first job made him an advocate for mental health, something he also hopes to incorporate in his Master’s project. Aaron now works with SNAP-Ed where he enjoys the “immediate impact” he sees in his clients through education. While Aaron teaches SNAP-Ed to a wide range of ages from preschool to senior citizens, he primarily works with students in alternative high schools. He uses the Extension program, “My Plate” to teach low-income families how to eat healthy on a limited budget. Eating healthy does not have to be something that breaks your budget. Aaron is inspired by Roger Rennekamp’s description of the SNAP-Ed program: if SNAP benefits are the fish, then SNAP-Ed is like teaching people how to fish. 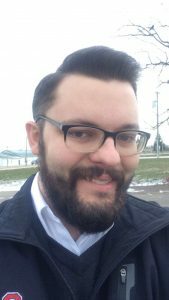 For his Master’s project, Aaron hopes to combine his passion for 4-H with his advocacy for those with mental illness. He would like to see 4-H become the activity that youth with disability and mental health disorders come to as their source for development outside of school. For this, he draws inspiration from Temple Grandin who credits 4-H and having the ability to work with animals from a young age in helping inspire her in her work. Aaron is just finishing his first semester in the program, so he is still not quite sure how he is going to combine these ideas in his project, but this is the direction he would like to take. In addition to his academics, Aaron serves as the online representative for the Graduate Student Association. This role is still developing, but Aaron as an online student himself, Aaron would like to find ways to keep the students in the online program involved with the Graduate Student Association. This may be through Zoom lunches or other distance opportunities. Watch for more information on this as the semester progresses. The one constant is that he is looking to make sure that everyone feels like they are part of the group. If you are an online student and have ideas for Aaron, please feel free to e-mail (fowler.440). When not busy with his graduate studies, Aaron enjoys spending time with his family. He is lucky that brother Ryan, sister Emma, and mom Karla are also located in Greene County and they are able to get together often. One year from today, this could be you! 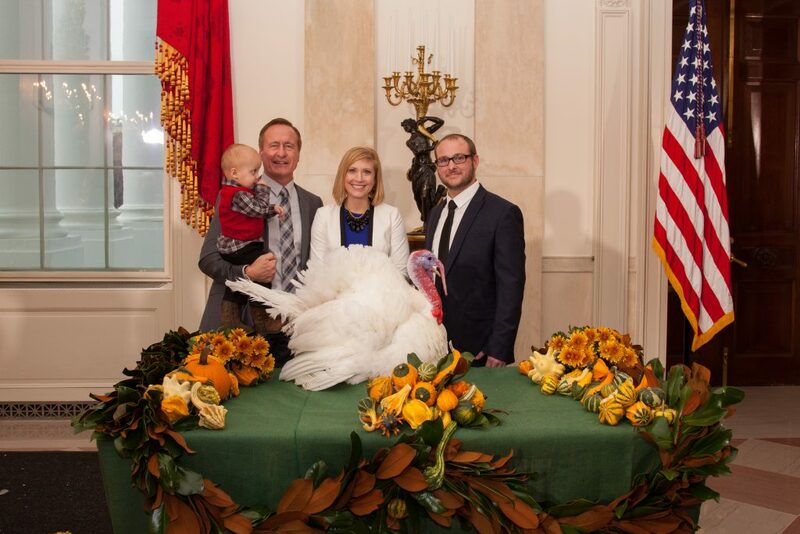 Olivia visited Washington DC this past semester with a delegation from Ohio Farm Bureau. I just completed my first semester at Ohio State as an agriscience education major! My first semester was filled with passionate professors, great new friends and even more. Through Ohio State’s ACEL program I have been able to learn from great and experienced professors that I believe are setting me up for success in the future. Along with amazing experiences in the classroom, I’m currently participating in my first study abroad trip to Nicaragua where I’ll be learning about agriculture from global perspective. I hope you’ll consider joining me at Ohio State as a Buckeye next year! Yesterday was the last day of final exams for students at The Ohio State University. One year from today, you could be done with your first semester as an Ohio State Buckeye! Doesn’t that sound exciting? If you are interested in becoming an Ohio State Buckeye, visit apply.osu.edu to complete your application. Applications for Autumn 2018 admission are due February 1, 2018. If you haven’t already visited campus, schedule an “Experience Ohio State for a Day” visit to learn more about the majors of agricultural communication, agriscience education and community leadership. Can a GM banana solve Uganda’s hunger crisis? 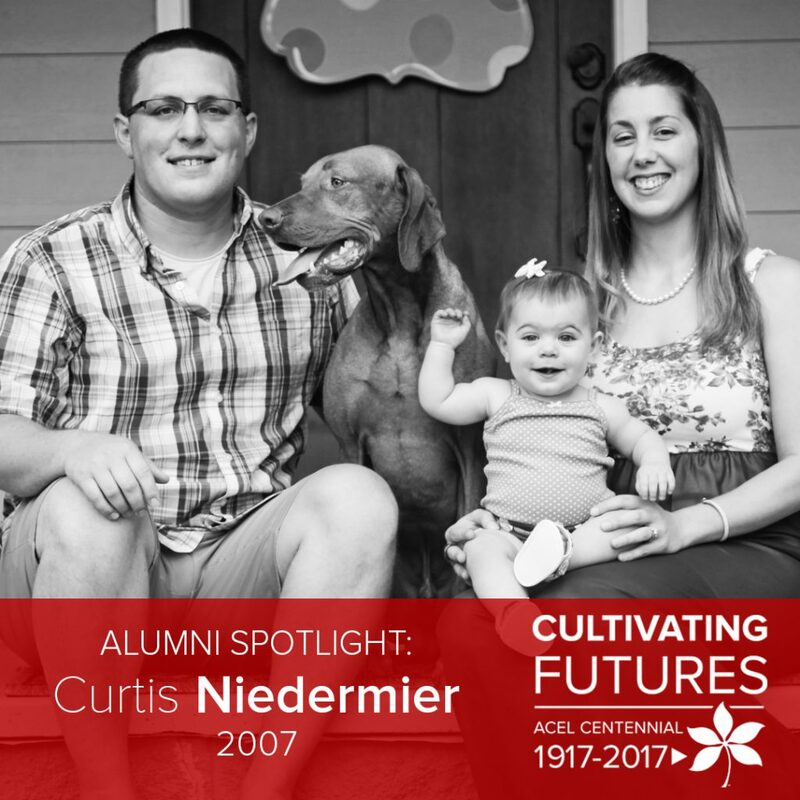 Curtis Niedermier graduated from Ohio State with a degree in agricultural communication in 2007. Shortly after graduation, he began working for FLW as an associate editor for their magazines. These days, Niedermier is responsible for the editorial content on flwfishing.com. [ACEL]: Hi Curtis! You majored in agricultural communication. What influenced you to chose that major? [Niedermier]: It’s complicated! For starters, I have a lot of interests, and often fleeting interests, and as a result I never really knew what I wanted to study or what I wanted to do after graduation, except I knew I was interested in writing. I always figured I’d find a job and then pursue freelance writing on the side, with hopes that I could write for outdoor magazines and maybe do some traveling to pursue my interests in hunting and fishing. Yet, for the first couple of years of college I never really considered pursuing journalism as a major. So I started with architecture then changed to construction systems management (CSM), which is when I really got involved on the “other side of the river” at CFAES. When I decided to ditch CSM, I learned about agricultural communication, and I found out I could stay in CFAES, which is where I really wanted to be, but could also take journalism classes that counted toward my major. That sealed it for me. The nicest people I met at Ohio State were all involved in CFAES, and having grown up in a small rural town in northern Ohio, I really felt like I belonged on the CFAES campus. It was a small school within a massive university. I was able to take advantage of the opportunities provided by a university like Ohio State with the perks of a smaller college feel. As I mentioned, I started off as an architecture major, and there are only a few schools in Ohio with accredited architecture programs. Ohio State is one of them. The OSU football team winning the 2002 national championship really sealed it for me. That game took place right when I was deciding where to go, and after that I was hooked on being a Buckeye. How did your education at Ohio State influence your career path? Obviously, my path at Ohio State wandered a little bit, but the choices I made really did set me up for my career. All of my advisors and professors in the agricultural communication program were positive people, and they all encouraged us to pursue big goals and dreams. That attitude helped give me the confidence to move away from Ohio after graduation and pursue a career in outdoor journalism. Also, I was able to participate in a couple of key internships while I was in the program that helped me get my entry-level job. I joined several student organizations aligned with my various majors, but the most impactful experience I had at Ohio State was being part of Alpha Zeta Partners. I made lifelong friends, had a great advisor in Dr. Garee Earnest and got to travel abroad to Brazil. The AZP program taught a lot of important lessons for me, and it came at just the right time, when I realized I needed to grow up and focus on where I wanted to go in life. I’m very proud to have been a part of it. I was also a member of Agricultural Communicators of Tomorrow and was one of three student organizers of Scarlet and Gray Ag Day. Does volleyball count, because I enjoyed that class? Really, I loved any class where I could learn and practice writing and editing, but my favorite was a magazine journalism class that was taught in the evenings by a full-time editor. My basic news writing class was also taught by an editor from The Columbus Dispatch. Their experience as working journalists was very valuable to all the students in the classes, and I still recount things they said or taught me to the writers I work with today. As I mentioned, Garee Earnest was a great advisor for AZP. I really looked up to Garee and stayed in touch with him for quite a while after graduation – though, unfortunately, not as much recently. He always pushed everyone to be better and to be leaders, which is what AZP is really about. He was a big positive influence in my last two years at Ohio State. Had I actually made it onto the field when Ohio State beat Michigan in Columbus to go undefeated in 2006, that might have been it, but since the law stopped me before I could get there I’d say spending six weeks in Brazil as part of AZP was the best experience, hands down. The reasons why are too many to list here. It was life-changing. I’m sure most AZP members who made the trip would say the same thing. I started at FLW about two weeks after graduation in 2007, and I’ve been with the company ever since. I celebrated 10 years in June. For those who don’t know, FLW is the world’s largest tournament-fishing organization. We host bass fishing tournaments all over the country and license our brand to several international fishing circuits. Our events range from national-level pro events with six-figure payouts to local tournaments for the weekend angler to free high school and college events where students can win scholarships. Ohio State has a very competitive college fishing team. My first job was as associate editor in the magazine department. At that time, we were publishing magazines for bass, walleye and saltwater fishing, each eight times per year. Our media department has transitioned several times in my career, and now we focus solely on bass fishing. I manage the editorial for FLWFishing.com, which includes reporting for most of the tournaments, and for FLW Bass Fishing magazine. You said you’ve worked for FLW for 10 years. Have you worked anywhere else? FLW is it. But I’ve also done some freelance writing for a few other publications and websites. The most notable is Outdoor Life. I also co-authored and co-self-published a book called Walleye Trolling with Capt. Ross Robertson, a Lake Erie walleye fishing guide. Staying employed for an outdoor magazine for 10 years is an accomplishment, but there’s no reward for that other than a steady paycheck. Most awards for outdoor writing are managed by outdoor writer associations, and I’m not a member of any, nor have we ever submitted our magazine for award consideration. My reward is that the FLW website is one of the most popular fishing websites on the internet, and one of the fastest growing. And the magazine is regarded as one of the best fishing magazines in the country. The work done by the writers, editors, photographers and video producers in my department is seen by hundreds of thousands of people every year. I’m very proud of what we’ve accomplished. There are particular stories I’ve written that stand out as my favorites, and there have been some fantastic trips to cover tournaments or to fish around the country. Those have all been highlights. Also, we just conducted our annual championship tournament, which is called the Forrest Wood Cup. It’s a huge event, with an outdoor expo, country concert, BBQ festival and a bunch of activities. This year’s attendance was more than 68,000. It’s the highlight of the year for me every year, and the memories I have from past championships will last forever. Two things: First, take chances early in your life, because as you get older it becomes more difficult to take risks. When I was preparing to graduate, I never thought I’d leave home, but I took a chance and moved away to another time zone. Taking that chance set up my career and changed my life. It would be much harder to do something like that at this point in my life, now that I have a wife and a little girl. The second thing would be to consider opportunities to work for yourself, even if it’s not full time. I’ve never been fully self-employed, but I’ve done enough freelance writing to know that there’s a great reward for being your own boss and working for yourself. An entrepreneurial spirit is also a valuable thing in any workplace because companies need people who think big and recognize opportunities to grow. More than anything I just felt like I belonged there. As I wrote earlier, I needed the small community atmosphere of CFAES and ACEL to really feel like I belonged at Ohio State. It’s such a big university that it’s easy to feel lost. Once I made it to ACEL, I was a lot more comfortable, and my confidence grew. From there, opportunities began to open up, and now I do what I love for a living. 4-H without a farm: Does the program have a future in big cities? One Organization. One Blue Jacket. Endless Opportunities. “I believe in the future of agriculture.” This simple statement is presented by countless first year FFA members each year. Some saying it simply because their FFA advisor made it an assignment, while others are competing in the creed contest. These students having no idea the impact one organization, one blue corduroy jacket can have. I was one of these students, I never imagined that the early morning competitions, National Convention trips, and the countless memories made with my FFA Chapter would shape me into the individual I am today. 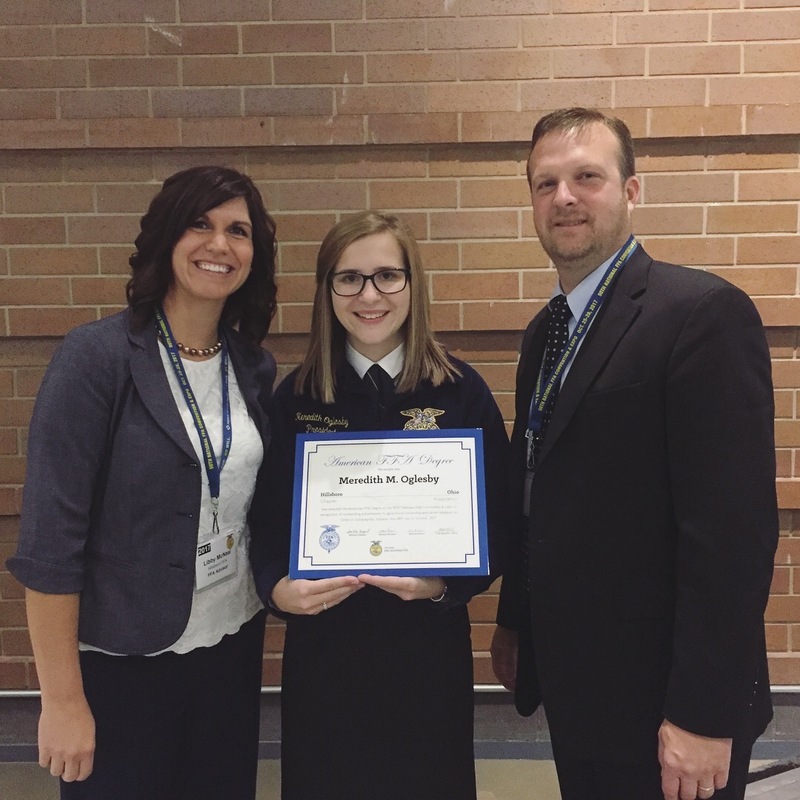 The American FFA Degree is the highest degree a FFA member can achieve. On October 28, 2017 I was fortunate enough to earn this degree, ending a six year journey through the FFA. Receiving this degree meant all the hard work had paid off. My SAE projects I maintained to be able to receive this degree included raising, showing, and selling market beef cattle and market lambs. I also maintained a herd of 25 breeding cattle. I grew pumpkins and gourds to sell to family and friends during the fall and also developed a garden at the Highland County Homeless Shelter. I will never be able to express how grateful I am for the experience I had through the FFA. I was fortunate enough to serve as the 2016-2017 Ohio FFA State Vice President where I advocated for agriculture and Agricultural Education, while engaging with students to increase their leadership skills. Traveling through the state meeting FFA members and seeing the diversity of this organization showed me the future of agriculture is bright. I will hang this degree on my wall to serve as a reminder of the organization where I discovered a passion for the agricultural industry, gained some of my closest friends, and found a love for serving others. Wearing my blue corduroy jacket may have come to a close but I will always be a proud supporter of the FFA. I will continue to encourage others to immerse themselves in an organization that allows you to find your purpose and embrace your passion. 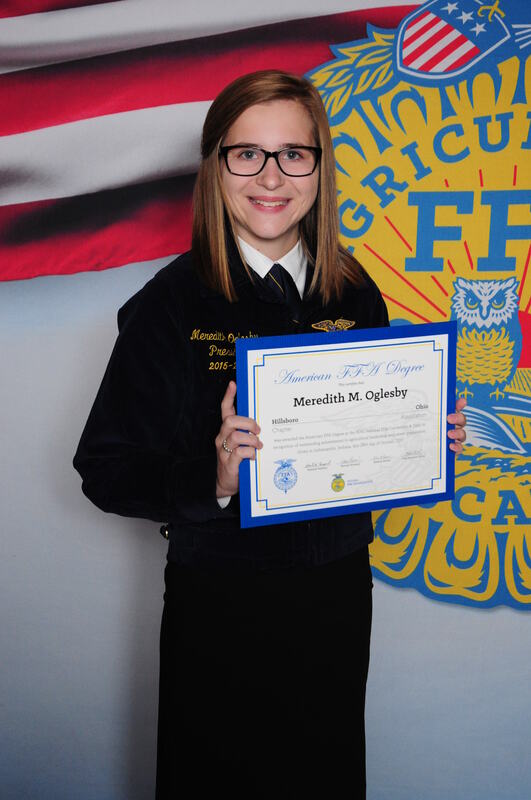 Oglesby with her American FFA Degree. More Ohio Union Activities Board events. Are you interested in applying to be an Ambassador for the College of Food, Agricultural, and Environmental Sciences (CFAES)? To learn more about what the CFAES ambassador team is all about, attend an information session, which will be held at 5:20pm on Wednesday, January 24 in room 247 of the Agricultural Administration Building. This is an optional activity to learn more about the application and interview process. We will have current ambassadors in attendance to share what their experiences have been. Feel free to attend if you are considering submitting an application for the ambassador team. We hope to see you there! These answers help our office provide prospective and current students with information about job outcomes. Thank you for taking time out of your schedule to answer these questions. Your name will not be attached to your outcome when shared in reports. *Reporting your internship through the link above does not enroll you in academic credit for the internship. Please meet with the Internship Coordinator from your department to enroll in internship credit. I-Corps@Ohio is an Ohio statewide program developed to assist faculty, staff, and students(undergrad, grad, & post docs) in validating the market potential of technologies and launching startup companies. I-Corps@Ohio is modeled after the National Science Foundation’s (NSF) successful I-Corps (Innovation Corps) program, which has been proven to increase innovation, entrepreneurship, and industry collaboration. I will mentor you through the application process and the workshop series next summer. See the information below. The deadline for submission of the application is January 16, 2018. We have some time to prepare the brief application. Just a few questions, submitted online, regarding your technology, your product or service, and market information – which I can help you obtain. Please contact me (Shauna Brummet brummet.1@osu.edu or call) soon to discuss your technology and product/service idea. Precision Ag Reviews is a project funded by Ohio Soybean Council and GIS Heartland. Currently there is no resource for farmers to compare precision ag equipment other than the salesman’s word. We are a non-profit and a bias third party. The premise is “Farmers Helping Farmers.” Precision Ag Reviews shows comparisons between products and new upcoming products. Check out precisionagreviews.com and create a review in less than 5 minutes to help farmers in your community make informed decisions. By completing a survey, you are entered into a raffle weekly to win a $100 gift card. The Conference is hosted by five land-grant universities from Indiana, Kentucky, and Ohio. It is designed for administrators, faculty, and staff from Cooperative Extension, research, and academic programs; private and public university representatives; K-12 educators; community outreach leaders; health and social services professionals; employers and supervisors; human resource staff; elected and appointed officials; and all others wanting to expand diversity efforts and increase cultural understanding in their communities and workplaces.For additional information click here. Collegiate Agri-Women is a soon to be chartered organization that is focused on women’s role in the agricultural industry and their impact on agricultural policy. Collegiate Ohio Agri-Women is directly linked to Ohio Agri-Women a professional and social organization of women in agriculture. Both of these organizations are affiliates of American Agri-Women, a national organization and the largest coalition of women in agriculture. The Collegiate chapter at Ohio State is looking to help college women interested in agriculture network with women currently in the industry. In addition, we are looking to educate our members on agricultural issues, while providing a communication link to the general public and legislators. Collegiate Ohio Agri-Women is also looking to help educate young people in schools and communities nearby. Meetings will formally begin after winter break; be on the look-out for posters with more information. However, please contact Maddie Bauer (bauer.551) if you are interested in joining the organization’s email list! Follow us on Instagram (@osuagriwomen) and Facebook (OSU Collegiate Ohio Agri-Women as well! CFAES Scholarship Application NOW OPEN! Any current student wishing to be considered for a college scholarship for 2018-2019 must complete the online college scholarship application between November 1, 2017 to February 15, 2018 in order to be considered. Current students receiving scholarships from CFAES must reapply to be eligible. Selection will be conducted spring semester. Generally, the criteria for these scholarships include a declared major in the college. Those who are selected to receive a College and/or Department scholarship will be notified via mail in June 2018. Please note we will only notify students who have been selected as a scholarship recipient. More information and application information available here. The Exploration of Modern Farming internship supported through a collaborative grant involving OSU, Wilmington College, Central State University, Battelle, Grow Next Gen, and Ohio Soybean Council will include a minimum of 40 hours (includes 8 hours of training) during the months of April through September 2018, in which the intern will be expected to educate people of all ages in one-to-one and/or in larger groups at a variety of events. The intern will be trained on how to educate the public in informal and formal settings including, but not limited to: county or state fairs, ag days for elementary school students, or classroom presentations. A training is a required and will take place on February 16–17 at FFA Camp Muskingum, beginning at 6 pm on Friday, February 16 and ending at 4 pm on Saturday, February 17. All lodging and food is free to the intern during this training. Mileage is not included. other outreach activities such as: soy ink, soybean seed necklaces, soy bioplastic, etc.